Did you watch Danny Gokey on Season 8 of “American Idol”? Are you watching the final season? Posted on January 18, 2016 January 17, 2016 by JanPosted in DiscussionTagged Danny Gokey. Not a lot of news in that interview but Danny does say that he has a performance of some type in the main concert as well as the pre-show. I had heard from his management that he will be the host of the Pre-show and do 2 or 3 songs during that segment. Danny then comes back during the concert– before the headliners?– And he does two more songs. So, not a lot of songs, but he will get to be perform for the full arena. Although, with these general admission shows, they are pretty darn full long before the start time. Unlike opening for a big name in country where a lot of fans would skip or not come into the arena for the first opener or more because the tickets are reserved seats. Danny no longer does the SHF Cruise?? Does the K-Love Cruise support a charity? Okay, I just looked the K-Love Cruise up. Danny is performing. I was just confused. What happened to the Sophia’s Heart Cruise? Hi Cindy, I think K-Love is a non-profit organization and they support a charity. Because of Danny’s heavy touring and recording schedule, SHF decided to take a break from it after 2013? I think they intended to go Fall of 2014? But we all know how crazy that year was for Danny with a new album. And now there is the K-Love Cruise. Jan Is @Artistsupporter the one used to purchase multiple albums from AI contestants? She likes ALL of the Season 8 finalists (from what I've seen). She was even on the Sophia's Heart Cruise in 2013 when Kris Allen and Jamar were guest artists for Danny. Maybe an earlier one, too? 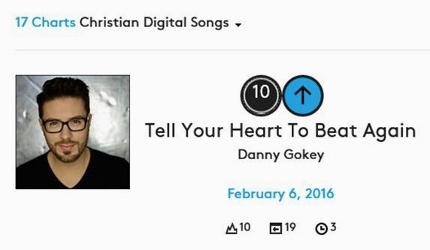 Danny's TYHTBA has risen on two of the Billboard charts I was able to check. Hot Christian Songs and Christian Airplay. I'll update last week's post with the new info when the other charts are available. Some people on twitter are suggesting that what Kris said about Danny was not much of a compliment…. And TYHTBA is on sale at Amazon! That can’t hurt, right? Only $.69 while still $1.29 on iTunes). Check our Facebook post or tweets for links. “Let’s just say there were a ton of acts that ‘weren’t available,’ ” Huie said. But organizers were able to offer some artists national TV time and all artists an international audience that might not otherwise be exposed to their music. I think Danny gets back from the K-LOVE Cruise on Saturday afternoon/night. A morning performance for him! At least it’s in Nashville! #TYHTBA is #16 on Mediabase today. Very close to #15. I think one song may go recurrent on the chart above him this weekend. Also, 27 stations playing it. Really nice growth. 2nd highest Spincrease on the CAC chart. In an aptly labeled website, this blog ranks 168 former American Idols and claims Danny was the worst. But who is going to read through all their rankings? I say they gave Danny top billing! I like seeing HIFOM climbing back up, too. Those stories make me sad, Jan. They should look at Danny’s chart standings.. Or, maybe they should remember kindness. But this is the Internet world we’re talking about, where people feel free to be their worst selves with impunity. It use to make me sad and/or angry to see the terrible motives that others assigned to Danny. But really, it doesn’t bother me like it use to. I really felt they did Danny a service by making him “the worst”. He is doing so much better, professionally, (I won’t comment on personal because who am I to judge?) than 90% of the contestants they ranked ABOVE him. Why would that be if he is the worst??? So, they put his name out there, in the lead of the article, again. Maybe it will help get him back on “American Idol”? Danny has always felt he needed to talk about his loss, his pain and his faith so that he could help others. He is loved for it in CAC and by many in the secular music world. I hope he doesn’t get tooooo comfortable in CAC….. I want his voice heard by more people! I think he wants that, too. One person can write an article for a blog. One friend can RT it. The whole world probably won’t see it. The less attention it gets, the sooner it fades. When Danny has a video put up on you tube, it usually gets one or two dislikes immediately. Those might be from people who don’t like him (because they liked another idol instead) and didn’t even bother to watch the video. They just wanted to click something negative about him. Many of the idol contestants have negative things said about them. I’ve read comments (on an Idol blog) from one person who I think must have been a Clay fan at one time because she keeps up with everything he does. She is not a fan now but still keeps up with everything he does–so that she can make negative comments about him. Even if a site that doesn’t like Danny picks up something negative that they gleefully share (or a site that likes him picks it up because they are worried and concerned), it may not be seen by many. I have sort of learned to press the ignore button in my mind. I can’t believe Danny Gokey was the worst ! I disagree with Vulture ! I’m sorry.. is “Vulture” the name of the website? Well, that’s says it all. Dang, Cindy3, you say it all! You call a spade a spade. I wasn’t as kind as Jan..
On another note… Danny and family are back. Glad “Tell Your Heart to Beat Again” is doing so well. Have a great rest of your weekend. We’re expected to get two more feet of snow tomorrow. 🙁 I was just beginning to see the ground. Last day of Danny’s American Idol tour pic. Looking forward to see what the admins have next in store for us, re Danny pics. It’s been an extraordinarily mild winter here so far. I think we got a grand total of one inch of snow — maybe.